Chandigarh 29th April:- Anil D. Ambani led Reliance Entertainment's pioneering movie platform, BIGFLIX, is now a global personal blockbuster for Indians in India and audiences across the world. Reliance Entertainment today announced the launch of BIGFLIX in a nine-language, multilingual avatar for India and global markets. With the re-launch, the country's first video-on-demand brand is back with a contemporary positioning and a bigger reach in and outside of India. The new BIGFLIX will have 2000 HD movies in nine Indian languages to start with, including Hindi, Telugu, Tamil, Punjabi, Malayalam, Gujarati, Marathi, Bhojpuri and Bengali. The indigenously developed technology of BIGFLIX will deliver a personalized theatre experience to users who can stream and download movies advertisement-free, on any Internet-connected device including personal computers, tablets, Smartphones, smart TVs and game consoles. BIGFLIX technology will allow a multi-screen experience to users who will be able to switch devices –Smartphone to tablet to television and back in the middle of a film. The same technology will also allow a clean and smooth film experience. Shibasish Sarkar, Chief Operating Officer, Reliance Entertainment said that indians are moving to digital entertainment in a big way with consumption growing on daily basis. Notably, BIGFLIX will fill in the void created by the decline of the home video market by digitally delivering movies. Amit Khanduja, CEO, Reliance Entertainment-Digital, said that globally the demand for video content has risen steeply, and the digital platform is witnessing a wider audience everywhere, including India. BIGFLIX will provide high quality video content from some of the biggest banners including Dharma, Disney, Viacom, Phantom, Telegu One and Rajshri, among others. In its revamped avatar, BIGFLIX will also serve the latent demand of the Indian expatriates across the world. With its multi lingual library of 2000+ HD films, including latest films, BIGFLIX aims to put an end to piracy and poor quality film viewing. BIGFLIX is one of the world's largest SVOD provider with over 3.9 million registered users. Launching with an aggressive pricing of Rs 50 for unlimited viewing per month, BIGFLIX is set to provide quality entertainment without breaking the bank across genres, languages and platforms. Chandigarh 29th April:- 'Jhankaar', a hindi music album , sung by Dr. Sangeeta Chaudhary and produced by Pal Music is released today at Press Club sector 27,Chandigarh. 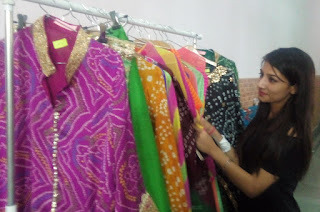 The album was released by the renowned Panjabi film actress Neena Bundel. The producer of Pal Music Company, Om Sharma said that the music of all the eight songs in the album has been given by Anil Sharma. The songs has been written by Kaazi Nazrul Islam and translated into Hindi by Dr. Sangeeta Chaudhary. A lot of albums have been released by Pal Music Company and they are being well received and good response among the listeners. The whole team of Pal Music Company including Navgaurav, Inderjee has helped a lot in releasing this album. Dr. Sangeeta chaudhary, done her Ph.D in vocal music from Panjab University, Chandigarh, and is at present organising Musical programs under the name of 'SWARA SAPTAK SOCIETY' and also imparting tuitions in music. She is recipient of 'Nazrul Award-2011', 'Sayiada Issabella award-2013' and many more. Her book entitled "kazi Njrul Islam dwara rachit geeton ka alochna" is already published and is being well received among readers. Neena Bundel said that soon her fan will see her in films. She is going to start her own movie. She said that she listened all the songs of albums and she really likes it. Chandigarh 29th April:- A case FIR No. 65, U/S 279, 304-A IPC has been registered in PS-3, Chandigarh against driver of unknown vehicle who sped away after hit to unknown pedestrian at 9/17 dividing road, Chandigarh. He got injured and lifted to PGI, Chandigarh where was declared brought dead. Investigation of the case is in progress. A Case FIR no. 66, U/S 336 IPC has been registered in PS-3, Chandigarh on the statement of Atul Verma of Guru Nanak Colony Rajpura Patiala (PB) who is working as finance Consultant in O/O special secretary finance, Chandigarh alleged that unknown person fire bullet on his Vento car no. PB-11AY-6667, while it was parked at UT, Secretariat staff parking. Investigation of the case is in progress. Ravi Khanna R/o SCO no. 208, Sector-24-D, Chandigarh alleged that someone has stolen Copper Pipe of A/c from Roof top of said SCO no. 208, Sector-24-D, Chandigarh. A Case FIR No. 83, U/S 379 IPC has been registered in PS-11, Chandigarh. Investigation of the case is in progress. Lallan Parshad R/O # 937, PH-10 Mohali (PB) alleged that driver of car no. PB-01V-3934 namely Inderjit Singh R/O VPO Jalajal Teh. Khanna, Distt. Ludhiana (PB) hit to Pulsar M/Cycle no. CH-03V-5848 at Sector-46/47 Dividing road.Motorcyclist Deepak admitted to GMCH-32, from where he was referred to PGI and expired later on. A Case FIR NO. 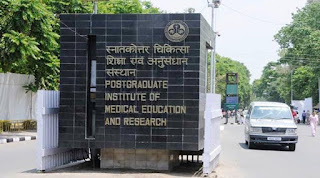 143, U/S 279, 304-A IPC has been registered in PS-31, Chandigarh Investigation of the case is in progress. A case FIR No. 128 U/s 420, 120-B IPC and 66-D IT Act registered in PS-39, Chandigarh on the complaint of Gurdayal Chand R/o # 3111/1, Sector-41-D, Chandigarh against CITI Enterprises JRS Value Ltd, which done fraud of Rs. 50 lakh approximately with complainant. Investigation of the case is in progress. Sanjeev R/O # 193, Shahpur Colony Sector-38/West Chandigarh alleged that someone has stolen away complainant's Activa Scooter no. CH-01AY-2616 from parking of market Sector-38-D Chandigarh. A case FIR No. 129, U/S 379 IPC has been registered in PS-39, Chandigarh. Investigation of the case is in progress. Chander Deep Vashist R/O # 2824, Sector-40/C Chandigarh alleged that Vishal R/O not confirm who was driving car no. PB-65AG-4486 hit to his car no. CH-01AZ-3011, near # 2683, Sector-40, Chandigarh. A case FIR no. 130, U/S 279 IPC has been registered in PS-39, Chandigarh. Investigation of the case is in progress. Beer inder Singh R/o Ward No. 9, Opposite Govt Primary School, Distt. Kharar, PB, alleged that driver of tipper number not confirm, which hit to complainant's Activa No.PB65H-9657 at Dadu Majra to togan road, Chandigarh on 28.04.2017. Resultantly pillion rider Jaswinder kaur got injured and was declared brought dead in GMSH-16, Chandigarh. A case FIR no. 66, U/S 279, 304-A IPC has been registered in PS-Maloya, Chandigarh. Investigation of the case is in progress. Chandigarh 29th April:- Prof. S. Varma, Acting Director,PGI honored eleven officers/ officials on their superannuation today by presenting mementoes to them. Amitabh Avasthi, DDA; Sushil Thakur, FA ; SHE and Senior AO(H) handed over beneficiary cheques comprising GPF, gratuity and group insurance. Respective Heads of Departments wished them well in life by presenting bouquets to them. 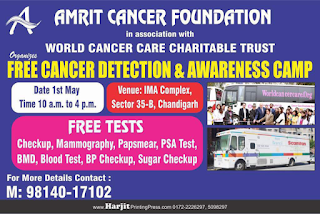 Chandigarh 29th April:- Amrit Cancer Foundation along with World Cancer Care Charitable Trust will organize a Free Cancer Detection and awareness camp on 1st May at IMA Complex, sec 35-B, Chandigarh. 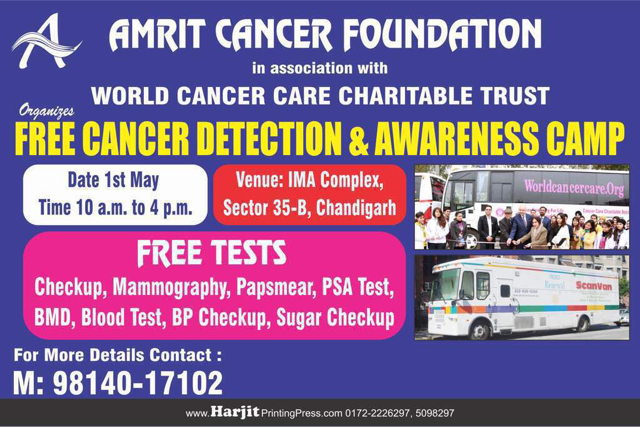 Governor of Punjab and Administrator Chandigarh H. E. VPS Badnore will inaugurate the cancer camp at 11 am. Sh. H. S. Sabharwal informed that 5 Special fully equipped with latest machines Mobile Screening Buses for detecting test like Mammography, Papsmear, PSA, oral cancer detect test will be deployed on the spot. These vehicles are specially fabricated by a U.K. Trust. Cancer Awareness Video will also be screened and leaflets on the same will be distributed. He said that a 20 doctor's dedicated team will participate, a cancer detection awareness talk will be held. In the camp 4 to 5 thousand people will participated, he told. Chandigarh 28th April:- Gulf Oil Lubricants India Limited (GOLIL), in association with, organized an interactive session between specially abled children from the 'Apang Kalyankari Shikshan Sanstha' and cricketers from Rising Pune Supergiant, the Pune-based IPL franchise. Steven Smith, Faf du Plessis and Jaydev Unadkat were the star players present from the team. They participated in a fun session with over 30 children from the NGO. The children met with the players amid much fanfare as the 'Gulf Fan Bus', team RPS' official fan vehicle transported these excited young kids from the institution to the venue. Post the ride the children participated in several fun games and got the opportunity to play with the three cricket stars. While the session was organized to acknowledge and motivate the children to follow their dreams, it also helped in rejuvenating the players from their daily schedule. The children were overjoyed to be able to meet and play with their favorite cricketers. On the occasion, Ritu Chhabria, Director- Finolex Industries Ltd. and Managing Trustee- Mukul Madhav Foundation said that we have been using sports as a medium of empowering children across our projects, witnessing tremendous transformation. We have been associated with Apang Kalyankari Shikshan Sanstha for a long time now and we are overwhelmed to have these international cricket stars meet children from our projects, making them believe that they have the potential to achieve the impossible. After a successful helmet drive for the traffic police in Pune, this is the second joint initiative with Gulf Oil and she is thankful to them; without whom this event wouldn't have been possible. Ravi Chawla, Managing Director, Gulf Oil Lubricants India said that it is a great pleasure to see the excitement and enthusiasm of the children to meet their favorite cricketers. It is an exhilarating feeling to see these little fans of the Rising Pune Supergiant. This initiative has surely helped to uplift the spirits of the cricketers alike the children. The champs have certainly shared a lot of positive energy with the cricketers. We truly appreciate the gesture of the three cricketers who willingly participated in the activity. We are also thankful to Mukul Madhav Foundation for giving us this opportunity and appreciate their commitment and work being done for the specially abled children. Gurgaon 28th April:- The Coca-Cola Company and its Bottling Investments Group (BIG) announced today new leadership appointments for its India & South West Asia Business Unit and Hindustan Coca-Cola Bottling operations. John Murphy, President of the Asia Pacific Group, The Coca-Cola Company said that as outlined by our President and Chief Operating Officer James Quincey a few weeks ago, The Coca-Cola Company is designing a new Operating Model to support the next stage of our transformation into a growth-oriented, consumer-centred, total beverage company. He said further that key components of this new Operating Model are a revitalized organizational capability and better system alignment to ensure that optimum execution multiplies our marketing plans and investment. BIG's President, Irial Finan, added that india is the 6th largest market for The Coca-Cola Company in terms of volume. The Coca-Cola system operates approximately 60 factories, directly employs 25,000 people and sells our products through over 2.6 million retailers. Still, the Indian market has tremendous growth potential, and we believe the revitalized system leadership structure that we announce today will enable us to continue consolidating India as one of the most important growth engines for The Coca-Cola Company globally. In bringing this new structure to life, the following senior leadership appointments in the India and South West Asia Business Unit of The Coca-Cola Company, and Hindustan Coca-Cola Beverages Pvt. Ltd, will become effective May 1: Venkatesh Kini, currently President, India and Southwest Asia Business Unit, who has capably served the company for 19 years, has decided to leave the company and return to the United States to pursue other opportunities outside the Coca-Cola system. "Over the past four years, Venkatesh has had a significant impact on the growth and success of our business in this very important market, and laid the foundation for a winning team that will enable us to continue capturing the great opportunities that remain ahead", said John Murphy. Venkatesh will remain with the Company until the end of July to ensure a smooth transition with his successor. T. "KK" Krishna kumar, who currently serves as CEO and South West Asia Regional Director of Hindustan Coca-Cola Beverages Pvt. Limited, will replace Venkatesh as President of the Company's India and South West Asia Business Unit. John Murphy added that KK is uniquely qualified for this role, having successfully led BIG's operations in India and South West Asia since 2009. He is a strategic, well-rounded leader, and has been a catalyst for expanding our portfolio and driving growth in every position he has previously held. KK joined the Coca-Cola system in 2004, and has advanced through a series of leadership roles including Region Manager and Regional Vice President. Vamsi Mohan, who currently serves as BIG's Region Director for Vietnam, Myanmar and Cambodia, will in turn replace KK as South West Asia Regional Director for Hindustan Coca-Cola Beverages Pvt. Ltd.
Finan said that Vamsi joined the Coca-Cola system in 1998 and has held various senior leadership roles in Operations, Market Execution, General Management and also served as Vice President – Sales for Hindustan Coca-Cola Beverages Pvt Ltd. We're fortunate and very glad to have him back in this market.